Back in 1999, I was in my final year of graduate school in finance and economics. Most of the students in my class and/or their families were involved in the Indian stock markets. The game was simple – apply for shares in an IPO and sell them at a multiple when the company lists. It was a “safe bet” and nothing could go wrong…until it did in 2000! Again in 2007 when I was completing my MBA, we had a similar situation with stocks, property and most asset classes providing phenomenal returns. What brought us down in 1999, 2007 and several times before is the greed and the herd mentality. As Warren Buffet says, be fearful when the markets are greedy. A decade later and the astronomical price gains in cryptocurrencies has drawn speculators, technologists, the public, and now regulators. With major economies like Japan approving the use of Bitcoin for transactions coupled with large companies like Expedia and Microsoft accepting Bitcoin, several believe that the crypto could replace fiat currencies – at least in a limited sphere of transactions. But will the currency live up to the hype, or is the entire concept just a fad and a bubble? Before we jump into the details, let think about some of the quotes from wise men that the investing community follows. At CityFALCON, we help investors do fundamental analysis and build and test their investment thesis by providing them with relevant financial news and content. Choose what you want to track from the list, and never miss an important news story every again from around the World in 30+ languages – Bitcoin, Ripple, Ethereum, Bitcoin Cash, Litecoin, ALL Cryptocurrencies. Disclosure: I do not have any positions in any of the cryptocurrencies and do not have any intentions to initiate any positions in the coming days. Cryptos have been around for a while, and we’ve even written about them before (How to buy Bitcoin, Ethereum, Cryptocurrencies, and What to Watch Out for and Cryptocurrency – Bitcoin, Ethereum, Ripple, Litecoin – Everything You Need to Know in 2017). The two largest, Bitcoin and Ether, have shown spectacular returns over the last decade. 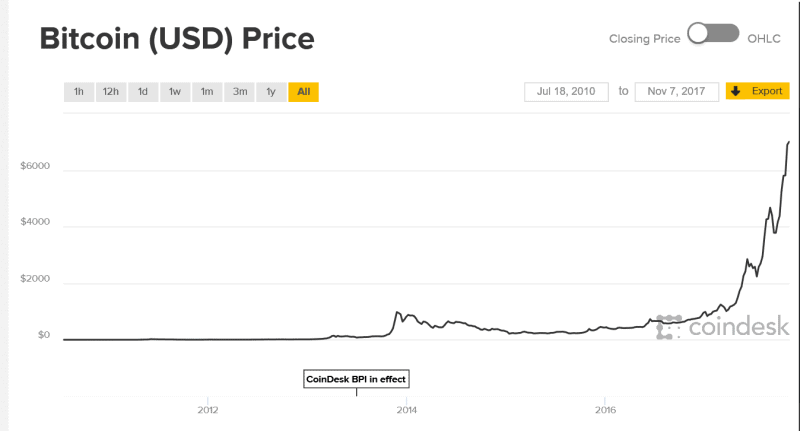 For reference, a $100 investment in Bitcoin in July 2010 would be worth over $11,000,000 today (give or take a couple million, as the price is notoriously volatile). 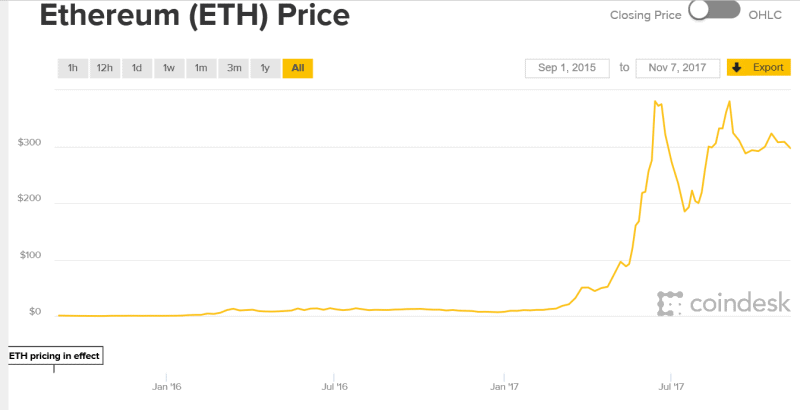 A similar $100 investment in Ether, in just October 2015, would yield about $54,000. Not as astounding as Bitcoin, but that was only two years ago. Hundreds of new cryptocurrencies with their own strengths and weaknesses have since appeared. Many have better technical implementations than Bitcoin, or they deliver on promises Bitcoin failed (such as anonymous transactions). Some are meant as Bitcoin replacements within certain spheres (Ripple, the third largest by market cap, is attempting to facilitate interbank transfers). Others are meant as Bitcoin complements, such as the privacy-focused Zcash. Some are the remnants of Bitcoin hard forks where the entire network didn’t follow suit. With the advent of Ether and the smart contract, suddenly tokens became available – a token is a tradable asset linked to a specific Ethereum contract, which uses the Ethereum network for settlement. All of these had cash injections from investors and buyers. Each actively traded crypto or token has seen some sort of money transfer. This transfer is so easy and lucrative that many startups have turned to ICOs (initial coin offerings), which are similar to IPOs, but without the regulations and underwriter costs. It also cuts out the pesky issue of equity transfer, and while token and coin buyers may own the means of the transaction on the system, the cash dumped into the project becomes that of the ICO authors, with little legal recourse (as of yet) for investors who are burned. The first problem Bitcoin solved was low transaction fees. The system uses miners or network participants who solve the cryptographic functions that secure the Bitcoin system. Every transaction is included in a block, and solving those blocks confirms the transactions in the block. Every time a miner solves a block, it is rewarded with some Bitcoin. A fee is not required, but miners are more likely to choose blocks to solve that have high transaction fees attached. Earlier, this wasn’t much of a problem, because there were not a large number of transactions. However, the considerable uptick in transaction volume combined with the number of transactions in a block has created a bottleneck – and recently, for a transaction to be confirmed in any reasonable amount of time, fees have skyrocketed (up to $7 a transaction, which makes small payments infeasible). So while the idea of low transaction fees for the masses was a great intention, problems have arisen – perhaps ironically – from popularity. The next main tenet of blockchain tech is a decentralized network, controlled by no individual entity. This eliminates the need to trust a central authority, such as a bank or government. For a technical description, you can find plenty of information on the internet (and we’ve written about it before here ). Bitcoin, as well as plenty of other cryptos, has achieved this by disseminating a copy of all transactions around the world. And in fact, there is no individual entity that controls more than 50% of the mining power in the chain. However, there is a theoretical attack called a 51% attack, in which one entity controls more than 50% – as of yet, it is still a theoretical attack. Because processing the transactions requires so much computing power, solving the blocks first has become too difficult for individual miners to be particularly profitable. Thus mining pools were born, where pools of miners work on blocks, which increases the probability that at least one processor in the pool will solve the next block. While this hasn’t lead to any single pool controlling more than 50% of the processing power, it is possible that some covert force is running more than one mining pool. If this covert force decides it is the time to strike, no one would know until it is too late. These two concepts seem to be incompatible, and in most cases, they are. Bitcoin achieved both, but only to an extent. Every transaction is recorded, so transparency is absolute. There are blockchain explorers such as Blockchain.info where one can enter a wallet address and see every single transaction involving that address. Thus, anonymity extends only as long as the identity of the wallet owner is hidden. If no one ever learns the identity of the owner of the wallet, Bitcoin is anonymous. However, this is difficult to do. There is plenty of metadata vacuumed up by all kinds of entities (NSA and GCHQ, local police, ISPs, your neighbour who hacked your WiFi). Even if you never tell anyone your wallet address, simply letting the wallet connect to the network at home – perhaps in the background, because you didn’t kill all the processes – can give you away. Couple that with connecting to the same cafe WiFi on the same operating system, one day with Bitcoin and one day with Facebook, maybe four months apart (so you forgot), can give you away. True privacy and anonymity are extremely difficult to maintain these days, and the transparency of Bitcoin makes eternal anonymity virtually impossible. Not to mention one must either mine or buy Bitcoin from someone to enter the network. Other cryptos have solved this problem by hiding wallet addresses or using clever tactics to mask identities. With such anonymity built in, the privacy-minded are likely to switch to these new currencies, further fracturing the crypto market. One of Bitcoin’s primary advantages was borderless transactions. At first, this included low fees for such transfers. Admittedly, banks can charge very high fees for international exchange, and often they bake some of those fees directly into the exchange rate (i.e., requires more dollars to buy fewer pounds than the market actually offers). Now, with the rising Bitcoin fees, there is an opportunity for companies like Transferwise and Revolut to capture customers solely concerned with borderless payment transfer. Not only do these services offer lower fees, they offer currency exchange on their platform. Bitcoin is itself a currency, and therefore one must convert a fiat into BTC, transfer BTC, then convert that BTC into the local fiat currency. These other startups allow direct spending with the most widely used currency already (i.e., the local national currency). Some, like Veem, are even using the technology that Bitcoin pioneered, the blockchain, to enable this kind of transfer. Bitcoin was the first major crypto. It has gained immense traction as major companies and even countries have embraced it. However, it seems this is due to the “network effect” rather than a solid understanding of the technology. This is largely due to the first mover advantage, which means the first to market, even if technically inferior, corners the market, largely restricting entry for competitors. Bitcoin is a great testing ground, but it is not a production currency. While Bitcoin does command a majority of all cryptos by market cap, the market is otherwise very fractured. This is one of the problems facing mobile payments and messaging apps as well (too many people use too many disparate services). For Bitcoin, though, where literally tens of billions of dollars are involved, this fracturing could lead to people shying away from the currency. If your messaging app fails, you just switch apps. If your currency fails, you lose all the wealth you hold in that currency. For cryptos, a technically superior product may be necessary. The security issues alone require a high degree of technical ability. Furthermore, the rising transaction costs will destroy any possibility of widespread adoption – no one wants to pay an extra £5 just to buy a £3 cup of coffee. For most people, the amount of electricity used for transactions wouldn’t graze their thoughts for a microsecond. You swipe your credit card or show a QR code and the money goes from your account to someone else’s account. A large portion of finance simply involves changing the bits in a database to show more money in one account and less in another, and this is really a very energy-efficient process. Due to Bitcoin’s nature, those bits change only after a long series of computations (in reality they’re guesses to brute force breaking a cryptographic puzzle). With so many transactions to be processed and an upper limit on block sizes, there is far, far more computation required for each BTC transaction than for each credit card transaction. This Motherboard article is a tech-heavy read on the subject, but the main point is that, in 2017, each BTC transaction requires up to 100 kWh of energy, or enough to power 3.5 US homes. Other cryptos are far more sustainable, not to mention old-school ledger movements. On the other hand, if the cryptographic function can easily be broken – brute-forced by a supercomputer/quantum computer or solved efficiently by some clever mathematics – the entity with the technique could easily command over 50% of the network’s processing power and thus initiate a 51% attack. Bitcoin is notorious for wild swings in value. Central banks are able to control their currencies’ prices against others, which means a loaf of bread costs nearly the same from day to day. Because Bitcoin’s pricing dynamics are more akin to a volatile stock, the price of bread might swing substantially. This is extremely detrimental to currency adoption because stability is essential for a currency. If you get paid 2 BTC a month and spend 0.5 BTC on rent, those may be locked in. Imagine how much havoc a halving would cause in the economy. Your salary and your landlord’s income is half every month, so that ratio is fine. But the grocer can adjust prices on a daily basis, and because he buys bread from overseas, his costs suddenly spike, which he passes on to you immediately. Continuity and stability are essential for a currency. Readers can easily extrapolate to products manufactured overseas or raw materials sourced from several countries. Other cryptos, Ripple among others, try to stabilize the price. First, these cryptos don’t attract as many speculators, because it is unlikely they will appreciate in price as spectacularly as Bitcoin. This is great for a true currency, and it may eventually cause people to switch to the stable currency rather than Bitcoin. Currencies like Ripple are not immune to volatility problems. One major criticism of Ripple is the company still holds 60% of the coins possible. This could be used to slowly add Ripple to the money supply as Ripple are destroyed during transactions (Ripple pays the network by destroying Ripple, which causes price appreciation for everyone). If the company decided to dump their entire stash at one time, though, the price would plummet. On the other hand, because so few people still own cryptos, the price has significant room to increase, especially if they catch on. Will Bitcoin be the currency to see squeezes on a rare commodity? It certainly seems that way now, but that doesn’t mean the public opinion won’t change suddenly and crush the price. One of the most worrisome current problems is the spread between bid and ask prices of Bitcoin against fiats. Due to volatility issues and swinging prices, the spreads on exchanges between Bitcoin and fiats or other cryptos can be discouragingly high. This may prevent people from entering the market, and it could cause issues for adoption. A merchant who wants to exchange her day’s revenue into fiat currency will have to use an exchange. Customers have to pay the higher asking price for BTC, so they don’t want to pay as many BTC at the merchant’s shop, but then the merchant can only recover the bid price for the BTC. This implies either businesses or customers absorb the spread for any sort of fluid conversions. For low-margin businesses such as convenience stores and gas stations, the margin may be entirely wiped out by the spread, incentivizing businesses to trade. But trading currencies in order to maximize revenue is a dangerous game, especially when the market is open 24/7/365. Normal, national currencies tend to have very small spreads on the open market, and transactions in cash are free. Legal tender is also very easy to come by and, by definition, usable anywhere in a country using the currency. Even credit card transactions are cheap compared to some BTC fees. Paying a higher transaction fee generally translates to faster confirmation. Even though credit cards charge a few cents for a transaction on a cup of coffee, they are nearly instant. If a BTC transaction only leaves a few cents for the network, it could take a few seconds – or several seconds. With an extra 15 seconds and 120 customers an hour, each customer’s processing time is 50% greater. While some people are friendly, few people want to wait an extra 2.5 minutes while the 10 earlier customers chat with the barista until the transaction finishes. Furthermore, even if a confirmation is received, it could be a detached or orphan block. The transactions in these blocks are confirmed, but somewhere in the world, a longer chain has already been created. Since the policy of BTC (and other cryptos) is to use the longest chain as the true chain, transactions confirmed in orphaned blocks revert to unconfirmed until another block incorporates them. This opens a huge risk for businesses in high-value businesses concerned with fast processing. If one or two customers at a coffee shop file chargebacks, the coffee shop has no problem. Sometimes the central authority (the credit card network) absorbs the loss. If a taxi ride across London costs £150 and the customer sees his transaction is no longer confirmed, the unscrupulous person might cause the taxi driver to lose his £150. For BTC to maintain its sky-high valuation, it will need to see widespread adoption. Unfortunately, many people don’t understand the technology, and, if one is cynical, it is expected banks and regulators will launch information campaigns to smear cryptocurrencies (because they’re not under control). With many illegal transactions done via BTC (and more and more with privacy-minded cryptos), it will not be hard to find a few prime examples of illicit activity facilitated by cryptos. Then the public will associate it with negative forces and avoid it, causing the price to fall. On a simpler level, people are often fearful of change and new technologies. While people are interested in cryptos at the moment, it still has many problems. There are many stories of exchange hacks, and while exchanges are not the blockchain, people associate them anyway. Moreover, people have to take financial and transactional security into their own hands. With no central authority to which customers may appeal, people will shy away from storing their life savings in an easily-lost, potentially easily hackable open-source wallet on their home computer. You can’t call or visit the blockchain to unlock your wallet. And one of the tenets of the blockchain, a decentralized network, is a libertarian dream. But most people don’t care who controls the blockchain. If a company like Amazon created their own mobile payment system and gave discounts for using it, would the general public care Amazon has essentially become a bank? Probably not. This will result in only the most die-hard privacy and decentralization advocates remaining in cryptos while the rest of the world switches to corporate-controlled, discount-granting, integrated, much-easier-to-use mobile payment systems. This scenario is one of the most plausible to cause a dramatic crash in BTC’s value. Make no mistake, this is a very hyped technology. ICOs have exploded across networks (just look at Ethereum, where the ease of issuing “tokens” have allowed startups (or scammers) to raise huge amounts of capital). Each new coin is a future potential competitor to BTC, and eventually, someone will build a better technology or a more influential marketing campaign. Each new coin fractures the market further, too, which weakens Bitcoin’s position as the unopposed crypto. See our article on ICOs for more information, but the main problems with ICOs are a lack of investor decision-making power and traceability. People invest based on whitepapers because… why not? Throwing smallish amounts of money at tens of startups makes sense if just one or two net 5,000% returns. Furthermore, the lack of regulation regarding these, coupled with cross-border transactions that require nothing more than an internet connection, make ICOs great places to hide money offshore while possibly making millions in the process. Since each new ICO is a BTC competitor (and most new tokens are made on the Ethereum network, the largest contender to BTC at the moment), there is constant competition with the currency. Many of these new coins are also technically better than BTC in some way (transaction times, anonymity, better fees, something). Innovation in finance is fast, but innovation in tech is faster. Additionally, the returns are reminiscent of the Dotcom Bubble. Money is pouring into companies with no revenue (let alone completed technologies), and the exchange is virtual coins, which can very easily be worthless. At least during the Dotcom bubble, equity in a company was obtained. “Equity” in the form of coins is an imperfect analogy because no individuals can own the blockchain (it is “owned” by the miners in a sense, but there’s no legal framework in which to work). Here we list some of the main arguments for Bitcoin by its proponents. We also follow up each argument with a counterargument and any concessions we should make to the proponents. Many of these arguments are found scattered throughout this article but have been collected here for convenience. At least in the near term, a valid argument for the rising price of BTC is the fear of losing out. People are social beings, and the hype can be powerful. 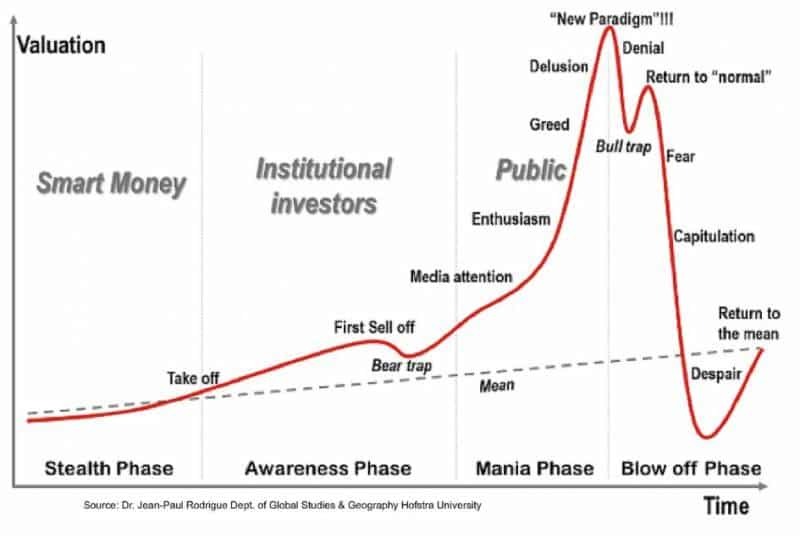 As demonstrated in the chart above, once the information becomes widely public, as BTC is now, Bitcoin’s price skyrockets. Assuming we are in the “enthusiasm” stage, this argument holds validity. Unfortunately, most people will get in late and lose money. We have two other bubbles that look similar: Dotcom in 1999 and the real estate/stock market runup in 2006-7. A vast number of those Dotcom companies, similar to BTC (i.e., no revenue or completely proven tech), are gone. And while houses are, of course, worth money, there are plenty of houses being sold very cheaply. Some people believe BTC is the new gold, a hedge against bubbles elsewhere. BTC is even better because gold is controlled by the powerful countries, but Bitcoin doesn’t discriminate against national origin. They are both even “mined” (which is not a coincidental term). However, gold is not immune to bubbles. Warren Buffett brought up a good point during a 1998 Harvard speech: “Gold gets dug out of the ground in Africa, or someplace. Then we melt it down, dig another hole, bury it again and pay people to stand around guarding it. It has no utility”. It does have utility in jewellery and especially in electronics. However, as an investment vehicle, it has little value other than to move out of other assets. Bitcoin could be a replacement for gold, but it is far too replicable to replace gold. Not only is some of the intrinsic value of gold based on its physical properties, there are not many precious or rare earth metals. They are what they are. Cryptocurrencies are extremely easy to replicate and improve. The supply of Bitcoin may be limited but the supply of coins is not. If it is easy to replace the “safe haven hedge”, is it really a safe haven? Government intervention is a difficult issue. It is true that BTC is decentralized (to an extent, as noted above), so it is less susceptible to announcements by the ECB or Fed. The government cannot completely control it, either. However, governments have extremely long arms and deep pockets. A government staging a 51% attack seems unlikely unless the country is hemorrhaging money. Furthermore, it is difficult for governments to seize assets on the blockchain. The weakness is the point of conversion. Most exchanges have KYC requirements, and as the closures of exchanges in China shows governments most certainly do have an impact on Bitcoin. If people cannot convert their cash into BTC, there is no way for the BTC ecosystem to survive. Further, servers are located somewhere in some government’s jurisdiction. The seizure of servers or laws banning BTC nodes could severely damage Bitcoin’s position. On the other hand, there are other threats to freedom of BTC. The community that develops the software for the network has significant say over the direction of the coin. When the community disagrees, a hard fork occurs. Sometimes these forks spawn new coins, which further exacerbates the stability problem. When people are holding a coin before the fork, they automatically get stakes in both the new and old coins. However, the value of a coin is largely dependent on perception and not a government guaranteeing its value. If national currencies could become worthless overnight due to technological changes implemented by developers, economies would be subject to extreme uncertainty. International transactions via BTC are currently done, and they are certainly capable of circumventing some capital controls (one major reason China closed down their Bitcoin exchanges). Of course, boasting that your product is the best at an illegal activity is probably not the best marketing strategy to engage the general public. So the international aspect of Bitcoin attempts to use low fee, peer-to-peer transactions as the main attractive force. As we saw above, there are plenty of other competitors moving in with lower fees, processing times, and greater ease of use. When speaking of market cap, Bitcoin is a currency and not a company. This needs to be acknowledged, and they are fundamentally different concepts. Businesses don’t routinely accept shares of Berkshire Hathaway for a cup of coffee (though it is by no means a bad trade for the coffee seller). Nonetheless, some argue that Bitcoin has a lower market cap than many listed companies. This implies there is plenty of potential for appreciation and, in turn, capital gains for the holders. After all, the M0 money supply of just the United States is around 4 trillion USD and BTC is around 100 billion. If it were to truly replace just US cash, there is potential for 40-fold growth. The problem with this thinking is that, unlike those companies, BTC derives its value entirely from perception. If people think it is worthless, it is. There is no liquidation value for the currency because it exists solely in the ether. There are no assets to sell, no cash flows to redirect to coin holders, and no centralized ownership to answer to investor demands or inquiries. The only physical asset in the system is the servers, but those belong to the miners, not the network. Hence comparing Bitcoin to a company is a fundamentally flawed argument. Furthermore, fiat currencies are guaranteed by governments to be legal tender, and people readily agree that, even without a gold reserve, the society so strongly supports the national currency it does represent real value. One thing we can concede to the market cap argument is that, as long as speculators buy the coin before the runup, they can make good money – but that’s the point: speculators are gambling, not investing, and real economies cannot use a casino chip for trade. One argument many make is first mover advantage and network effect. As argued elsewhere in this article, these two concepts are true of Bitcoin. However, companies like MySpace and Blackberry had first mover advantage and strong networks, but they’re both largely irrelevant today. Unfortunately for Bitcoin, other companies have massive network influence, too. If Facebook or Amazon were to launch their own cryptos and gave preferential treatment to them, would anyone continue to use Bitcoin? As stated above, probably not. Bitcoin has the network effect, but so do more entrenched and larger companies. Many of these ICOs will go to zero or near zero. The volume might dry up, too, drastically widening spreads. If cryptos become a mainstream interest (outside excited speculation on the price), the crashing of so many other cryptos could easily push people into Bitcoin’s influence (though other cryptos, like Ether, could easily replace Bitcoin). Companies accepting Bitcoin is a massive first-mover advantage. Since some companies already accept the currency, any competitor must replace Bitcoin rather than simply win the race. This is a very different challenge, and, as stated above, people are rather resistant to change. The blockchain is, no doubt, a revolutionary technology. It will revolutionize finance, and in some ways, it already has. There is always debate as to whether the Internet has created a borderless world – perhaps it has really further enveloped us in our own bubbles. But the ease with which unregulated transactions can be transmitted across borders, from unknown senders to unknown recipients, without a single cent being handed over to governments or banks in the process, has shown the power of cryptocurrencies to make the world borderless. This technology is here to stay. Blockchain has plenty of uses outside cryptos (smart contracts embedded in Ethereum are one such example), but Bitcoin probably won’t be the reigning technology in the future. It’s overvalued with a limited chance of success, most likely be replaced by a better cryptocurrency. The cryptocurrency and blockchain world is awash in change, and today’s technology or idea may be obsolete tomorrow. This breakneck pace of change means the space will remain volatile, and it ensures there will be significant innovation over the next few years. Are you just trying to get my attention? You study economics so you want to gain money i think.So my question is that since you now how bubbles works why dont invest and you withdraw before bubble explode? 1)fiat money you think is less or more bubble than btcs ? 2)since fiat money loosing value day by day ,isnt correct to say that their value goes closer and closer to zero? Bitcoins are like bingo Up and up. Now it has a great price. Why people will use Bitcoin as a payment alternative although it took hours to transfer?